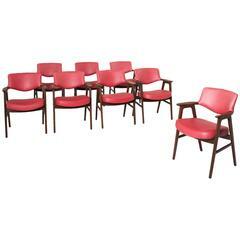 Kai Kristiansen for KS Møbler, set of 8 dining chairs, rosewood, fabric, Denmark 1950s. The chairs show beautiful and well designed lines and joints. The curved back and armrests are mounted on the oblique rear legs, which provides an open, light expression. A nice grain of the rosewood is visible on the whole design but especially on the curved back and small armrests. Kai Kristiansen (1929-) was trained as a cabinet maker and worked for a couple of years under Kaare Klint. In 1955 Kristiansen started to work as a designer to and opened his own design studio. As a designer he collaborated amongst others with Kjaersgaard and Fritz Hansen. Kai Kristiansen style is defined by clean lines, simplicity and high-quality natural material. This specific set has been reupholstered in a grey high quality fabric by the experienced craftsmen in our in-house atelier. Upholstery in other fabric is also possible as you desire. Please ask our advisors for the almost limitless possibilities that our atelier has to offer. Please note that the price is per item, not for the set. Set of four rosewood dining chairs by Kai Kristiansen, 1960. Rosewood chairs with tapered legs upholstered in black leather.